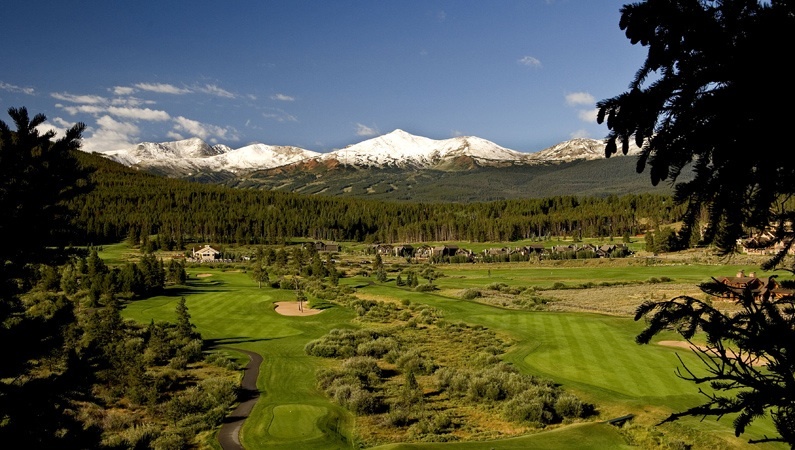 #Breckenridge Golfing on a Jack Nicklaus Course…. Now that the 2014-2015 ski season has officially closed, one might think that the town goes into summer slumber, biding time until the next ski season arrives. Nothing could be further from the truth! Breckenridge is bursting with life! Outdoor enthusiasts gear up for their personal favorites – kayaking, canoeing, fishing, camping, biking, golfing- anything that can be enjoyed in the bright sunlight and refreshing spring and summer breezes awaits the outdoor adventurer in Breckenridge. As a matter of fact, the town of Breckenridge is considered the only municipality in the world to own it’s own Jack Nicklaus designed 27-hole golf course! The absolutely spectacular course surrounded by stunning scenery, has been awarded national and regional honors including state awards for: Best Mountain Course and Toughest Mountain Course. Golf Digest “Places to Play” rates Breckenridge as a 4 1/2 Star Facility, and as one of their top “Upscale Places To Play” in the nation. In May 2013, Golfweek rated Breckenridge as one of the “Top 50 Municipal Courses” in the nation (#34). The course is also Zagat rated. There are also great family fun adventures in Breckenridge, plus great shopping and dining experiences. There truly is something for everyone to enjoy that will create memories to last a lifetime. Breckenridge is an all season town. Find out why discerning buyers from around the world are taking advantage of the fractional real estate opportunity to make Breckenridge a second home, coming back over and over again to refresh and renew, without hassle. Just relaxing and reinvigorating. Find out how to make it your home away from home. One of the most exclusive fractional real estate properties sits right at the base of Peak 8 with stunning views and world class amenities. There are still some inventory available at the Grand Colorado on Peak 8, but with only 75 units total, the remaining units won’t last long. The Grand Colorado on Peak 8 will be THE address to have in Breckenridge, so if you want to own an exclusive second home at a fraction of the price on the slopes in Breckenridge, you really do need to get busy NOW. Pick up the phone and call Brent Henry, Senior Broker, and let him know what you are hoping for. There are 4 bedroom all the way down to studio units available, designed in luxurious mountain modern style and equipped with every amenity. This entry was posted on April 27, 2015 by elevatemarketingaz. It was filed under Breckenridge Colorado Luxury Condo Sales, Breckenridge, Colorado Real Estate, Fractional Ownership Real Estate Breckenridge CO, Fractional Ownership Real Estate Summit County Colorado, Luxury Fractional Real Estate Breckenridge Colorado, Luxury Fractional Real Estate Summit County, Colorado, Summit County Colorado Luxury Condo Sales, Summit County Colorado Real Estate, The Grand Colorado on Peak 8 and was tagged with Breckenridge Colorado accomodations, Breckenridge Colorado condos, Breckenridge luxury condo sales, Brent Henry Breckenridge real estate broker, Grand Colorado on Peak Eight, Jack Nicklaus golf course, Summit County Real Estate.